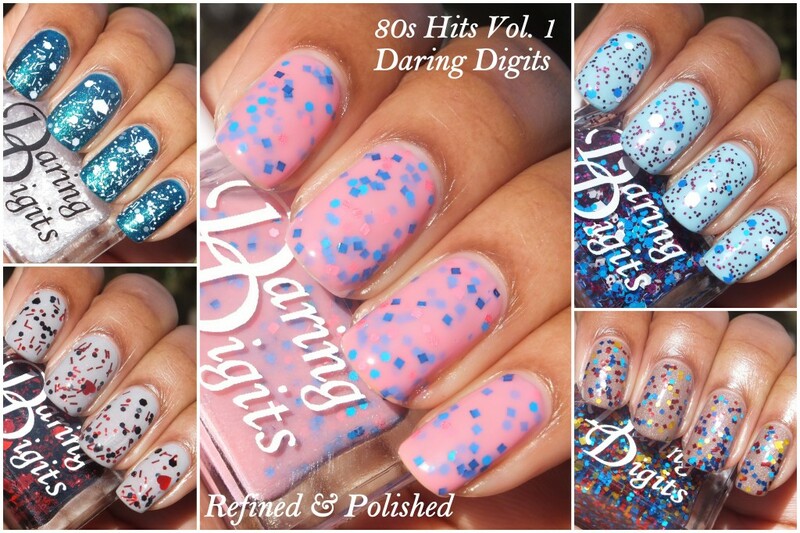 Daring Digits has released an amazing ten piece spring collection with polishes inspired by the biggest song of the each year of the 80s. Today I have photos of 80s Hits Volume 1 for you. Get ready to take a stroll down memory lane as you remember the first time you heard each song. For your listening pleasure, I’ve linked each artist with its corresponding youtube video. 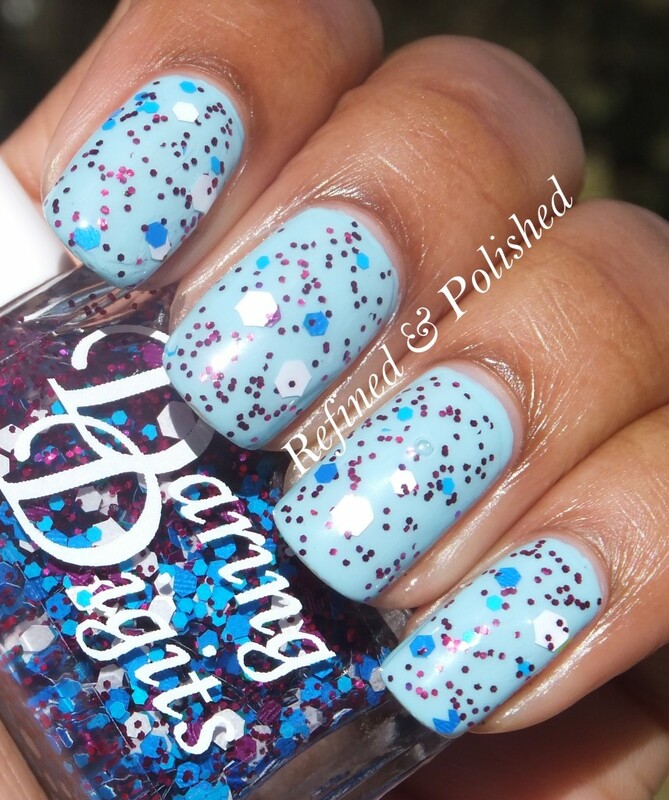 Call Me (Blondie, 1980) is a light pink jelly base filled with pink and blue square and hex glitter. This shade was inspired by the single cover. Call Me’s formula was flawless! This color is so me and is hands down my favorite from this volume! I used three thin coats for opacity. Physical (Olivia Newton John, 1981) is filled with purple, white, and blue glitters of various sizes. 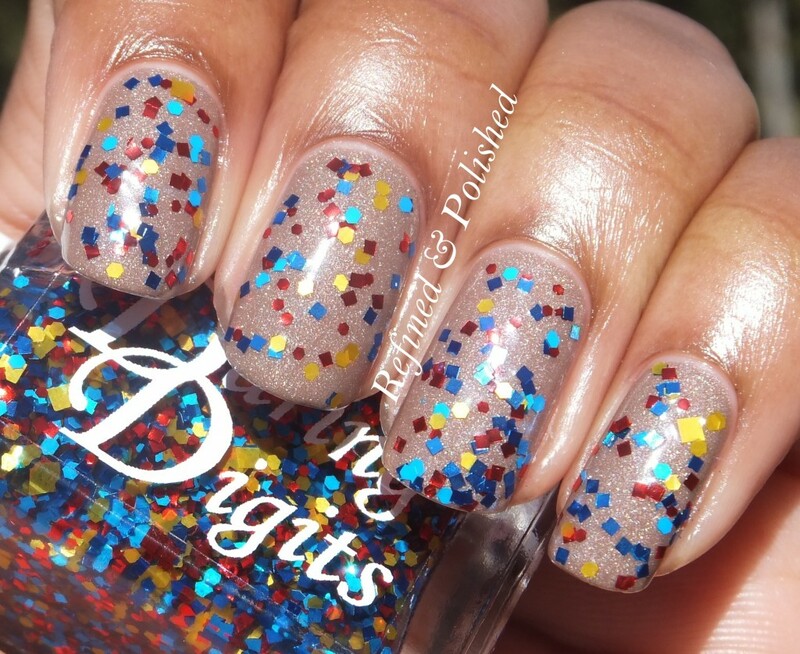 This glitter is inspired by the outfit worn by Olivia Newton John in the video. Oh the days of when people wore leotards and tights out in public as real outfits. As a lot of the glitters in Physical are large, I stored the bottle upside down for a bit to aid in coverage. I wore one coat of Physical over Sinful Colors Sugar Rush. 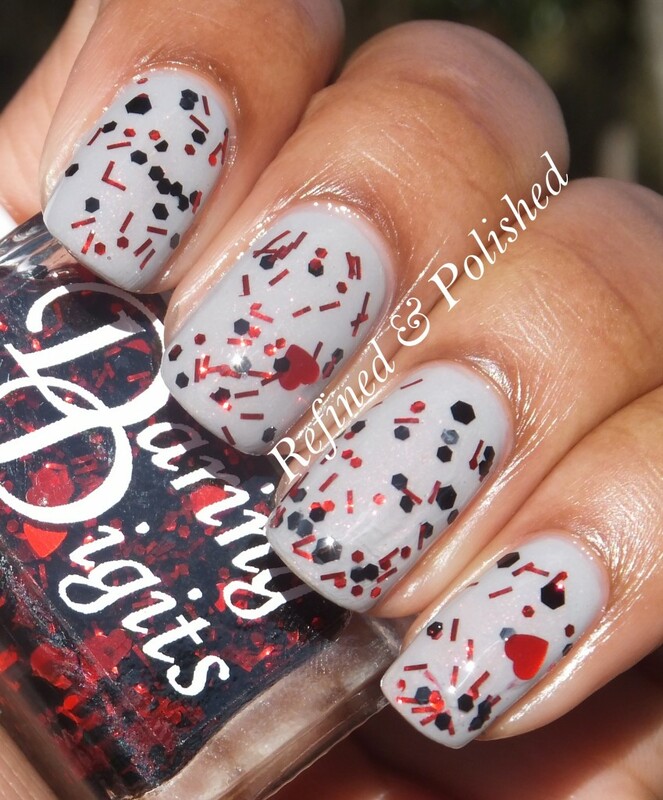 I <3 Rock and Roll (Joan Jett and the Blackhearts, 1982) is filled with black and red hex, bar, and heart-shaped glitter. This is one of those songs that everyone knows the lyrics to, but couldn’t tell you the artist’s name to save their life. The polish was inspired by the band name and Joan Jett’s red leather outfit in the video. The base of this one was much thicker than the others. I had to dab to put most of the glitters in place and I would recommend waiting in between coats for no globbing. I wore I <3 Rock and Roll over Essence Grey-t To Be Here. Every Breath You Take (The Police, 1983) is filled with red, blue, and yellow square and hex glitter in various sizes. It was inspired by the single cover which featured stripes of the same colors. The glitter is not as dense, so dabbing is required to fill in some areas. I used one coat over Butter LONDON All Hail the Queen. Like a Virgin (Madonna, 1984) is filled with various sized white hex glitter and bars. It was inspired by Madonna and the innocence of white (get the oxymoron). 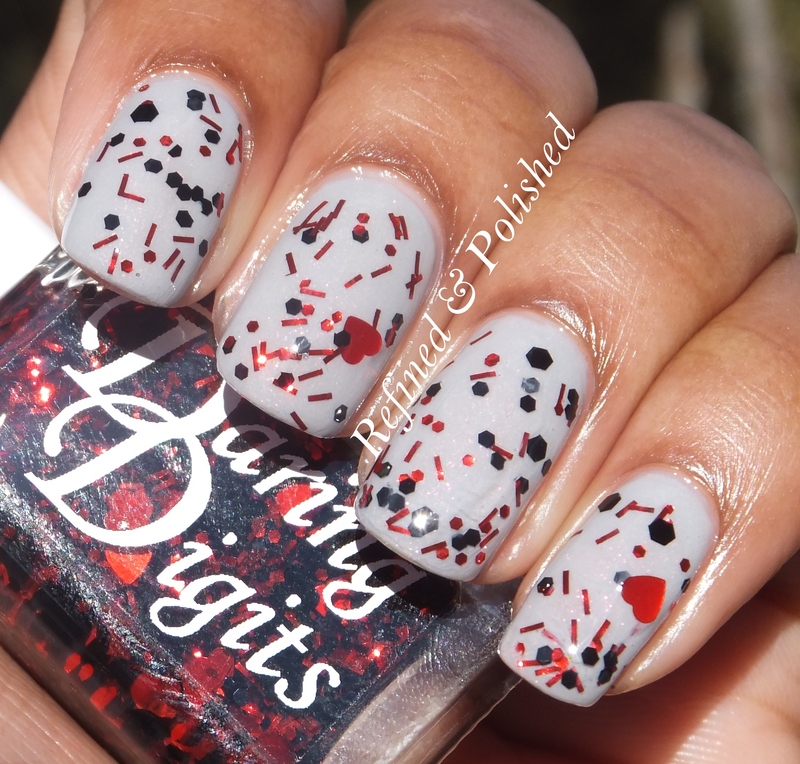 The formula was easy to use, but I did have to dab the larger hexes onto the nail. I layered one coat over Zoya Charla. This is such a fun and unique collection! I had a great time writing this post and listening to these hits. I’m an 80s baby, so I grew up hearing all of these songs. My favorites from Volume 1 are Call Me and Physical. Those of you who are into shaped glitter and bars will love several of these. The 80s Hits collection is available both individually and as a set. 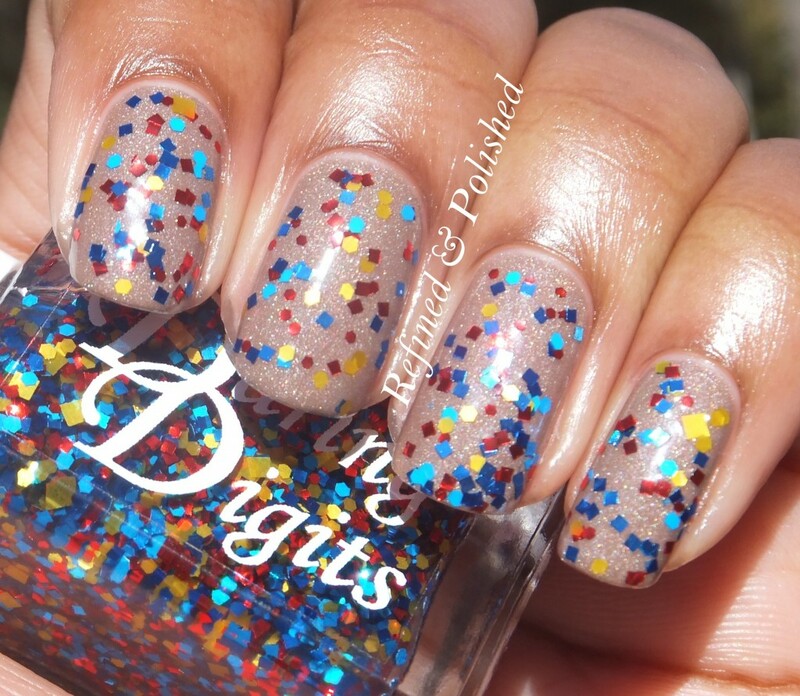 Daring Digits polishes can be purchased here and you can keep up with her on facebook and instagram.